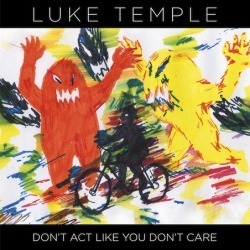 "Before the success of his group Here We Go Magic, Luke Temple worked full-time as a plasterer. At nights after work, he spent his hours crafting what would become Here We Go Magic's self-titled debut. During the days he wrote a completely different set of songs in his head. The resulting record Don't Act Like You Don't Care shines with clarity and daylight, in contrast to Here We Go Magic's hazy aquatic debut.After recording two critically acclaimed solo records for Mill Pond (2005, 2007) Temple's work still hadn't garnered much attention from the record-buying public. Frustrated, but not defeated, he focused his creative energy into the writing of two amazing, but completely different records. Initially referred to as "The Country Record," Don't Act Like You Don't Care was shelved due to the success of Here We Go Magic's self-titled debut. Now, three years later, we're finally able to offer this incredible collection of folk-pop songs." The album proper doesn't come out till August 30th, but you can hear the first single "Ophelia" right now and begin to get excited for what is going to be one of the best releases of the Fall.